Reading Nigella Lawson's book Kitchen is turning out to be quite an educational experience. She has certainly packed a lot of recipes in there, but there is also plenty of great tips, and very interesting facts about food. 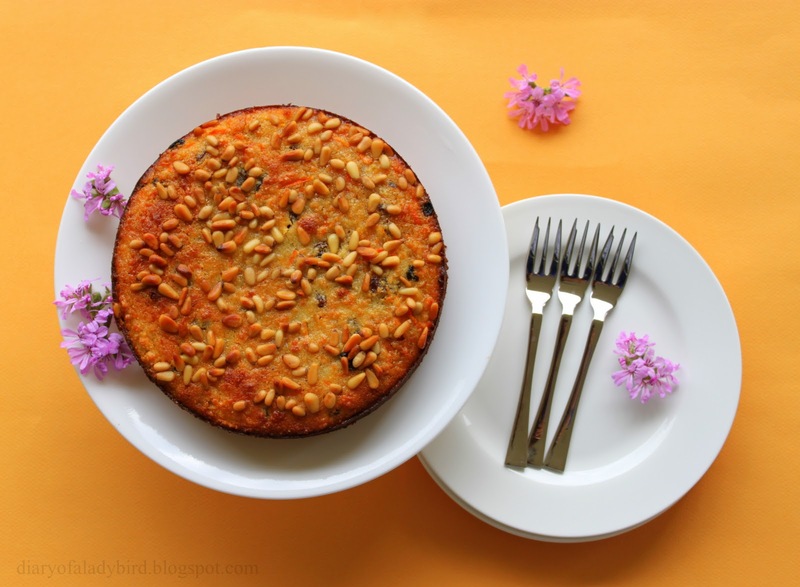 For example, while reading this recipe for her Venetian Carrot Cake, I learnt that it was not the Americans that invented carrot cake, but rather, it was the Venetian Jewish community who made the first carrot cake. Unlike the American version which is usually quite big and accompanied with heavy cream cheese frosting, this cake is not a lot to look at. However, as Nigella promises "it is divine to eat". I couldn't agree more, but I'll give you more on my verdict a bit later. First, here is the recipe for the cake, as well as the mascarpone cream to have alongside the cake if you wish. 1. Preheat the oven to 180 degrees Celsius/gas mark 4. Line the base of your cake tin (Nigella suggests 23cm round springform tin, I used a 20cm tin) with reusable silicone liner or baking parchment and grease the sides with olive oil. 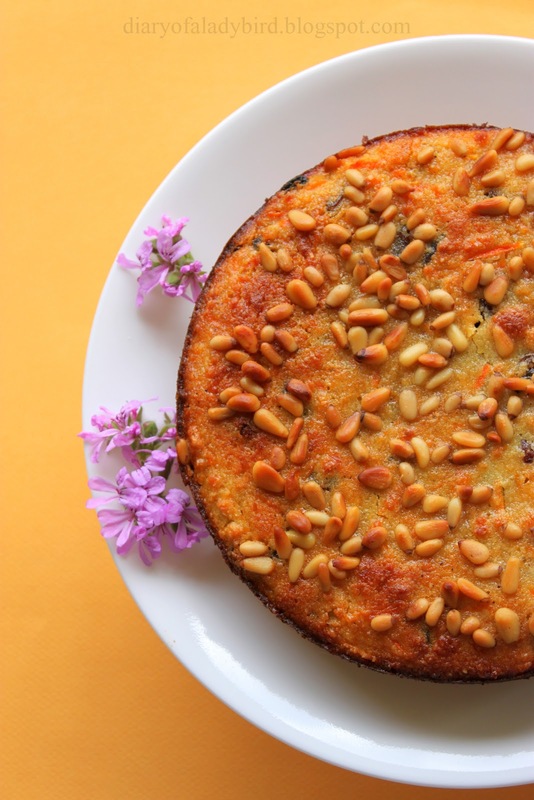 Toast the pine nuts by browning in a fatless pan; the oven alone is not enough to scorch out the paleness. 2. Grate the carrots in a food processor (for ease) or with a coarse grater, then sit them on a double layer of kitchen roll and wrap them, to soak up the excess liquid. 3. Put the golden sultanas in a small saucepan with the rum, bring to the boil, turn down and simmer for 3 minutes. 4. Whisk the sugar and oil - I use my freestanding mixer, but it wouldn't be much of a faff by hand - until creamily and airily mixed. 5. 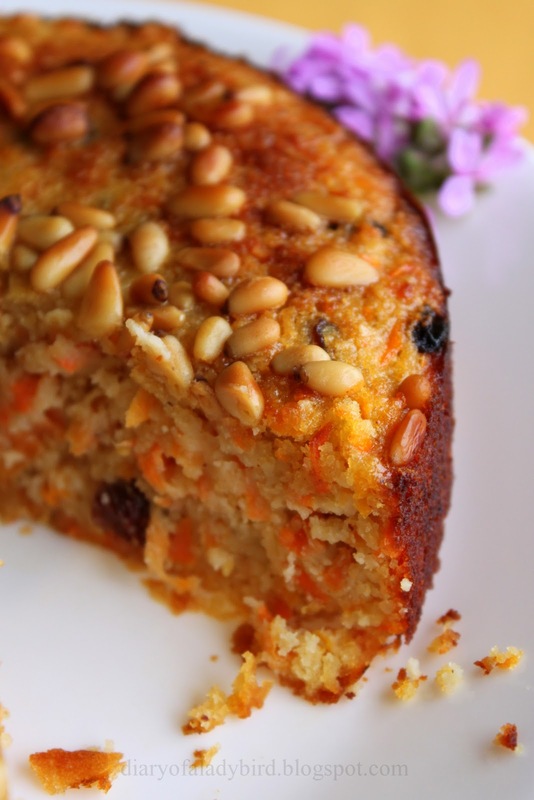 Whisk in the vanilla extract and eggs and when well whisked, fold in the ground almonds, nutmeg, grated carrots, golden sultanas (with any rum that clings to them) and, finally, the lemon zest and juice. 6. Scrape the mixture into the prepared tin and smooth the surface with a rubber spatula. The batter will be very shallow in the tin. 7. Sprinkle the toasted pine nuts over the cake and put into the oven for 30-40 minutes or until the top is risen and golden and the cake tester comes out sticky but more or less clean. 8. Remove from the oven and let the cake sit in its tin on a wire rack for 10 minutes before unspringing and leaving in on the rack to cool. 9. Remove the cake to a plate to serve; mix the mascarpone with the icing sugar and rum and put in a bowl to spoon alongside, for those who want. Delicious! This cake might not be the prettiest cake around, but what it lacks aesthetically it makes up for in flavour and texture. 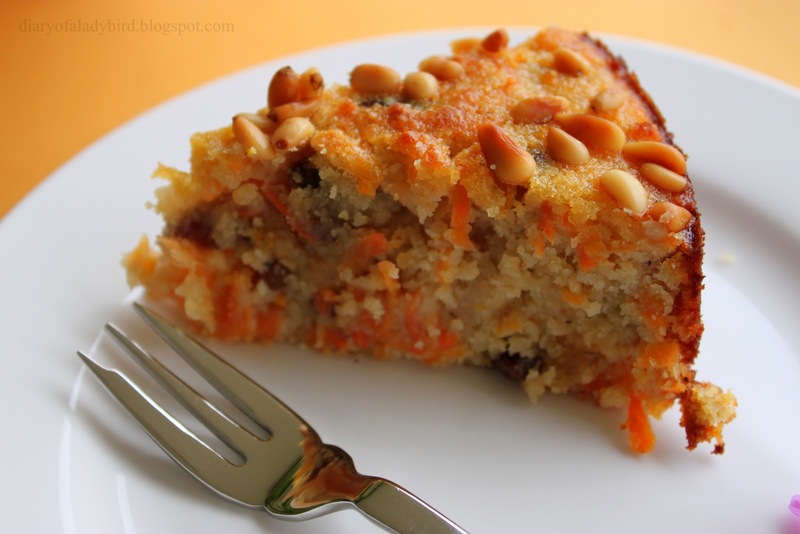 It is wonderfully moist, and the flavour is superb - not obviously carroty, and with a hint of lemon. This recipe is definitely a keeper! I love the 'american' version of carrott cake, but I also love pine nuts. This cake looks lovely and moist. Im suprised to see rum as an ingredient though. fantastic ! but just one question, is there no flour to this cake? and no baking soda? 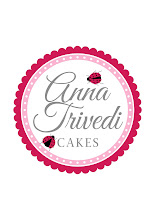 Tana yes, there is no flour or baking powder in this recipe - 100% gluten and dairy free! aww. I would be so happy if my cakes turned out liek this! I'm bookmarking this recipe in my copy of Kitchen. The cake looks so moist and inviting! I'm really trying to resist buying Kitchen and this isn't doing me any favours! =p Think I have all her cookbooks bar one so the urge to get this one as well is high. This look delicious and I love that it's gf and almost vegan too! 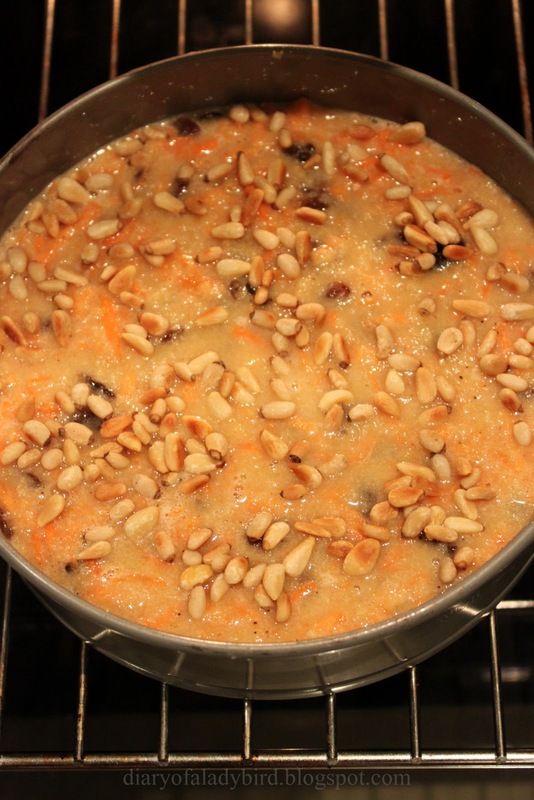 I never knew that about carrot cake and I grew up in Venice! I love these snippets of food history, can never get enough. This cake sounds so delicious! I haven't yet tried any recipes from the Kitchen, but have bookmarked many! 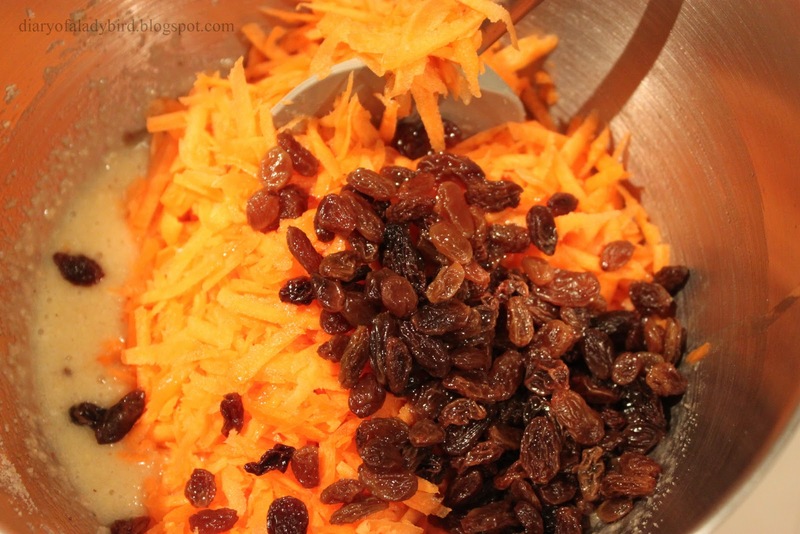 Inspired by your post I tried a fodmap version of this recipe, leaving the sultanas out to avoid the fructose. Unfortunately I nearly forgot the eggs and it ended up tasting very breakfasty!